The first misconception of modern economics is that supply and demand for one good determines the price of a good. 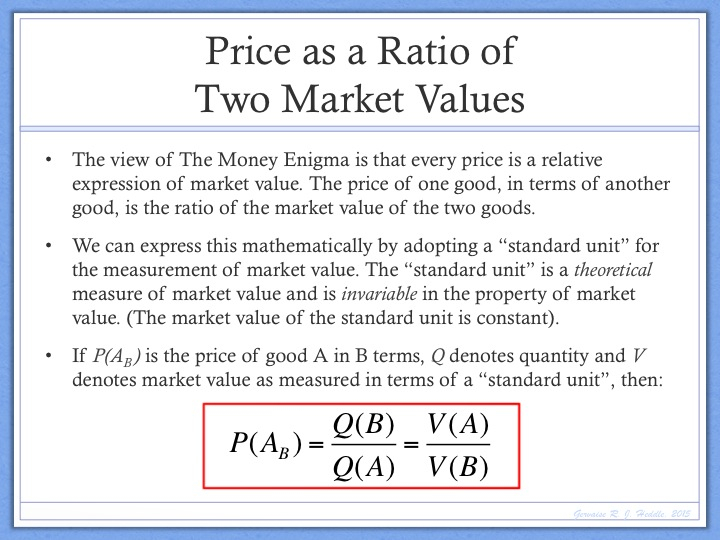 The view of the Money Enigma is that the price of one good in terms of a second measurement good is determined by both supply and demand for the first good and supply and demand for the second measurement good. Consider the following example. Imagine that we live in a barter economy with two goods: apples and bananas. Does the price of apples in banana terms depend on (a) supply and demand for apples, or (b) supply and demand for bananas? The answer is (c), “both”. Think about it this way. What would happen to the price of apples in banana terms if there was a sudden shortage of bananas? All else remaining equal, if there was a sudden shortage of bananas, then bananas would become more valuable. Therefore, it would require fewer bananas to acquire one apple and the price of apples in banana terms would fall. Although there has been “no change” in the market value of apples in an absolute sense, the price of apples falls because the measurement good is now more valuable. In other words, the price of apples in banana terms depends upon both supply and demand for apples and supply and demand for bananas! The myth that the price of a good is determined solely by supply and demand for that good has sustained itself for a long period of time because it is based on a half-truth. Supply and demand for a good does determine the market value of that good. But the price of one good, in terms of another, depends upon the market value of both goods being exchanged. What determines the market value of the second good? Another set of supply and demand! The traditional representation of the supply and demand paradigm, with price on the y-axis, obscures the true nature of price determination. At the most basic level, a “price” is nothing more than a ratio of two quantities exchanged. This ratio of exchange is determined by the relative market value of the two goods being exchanged. By definition, we can not measure a relative relationship between two goods unless both goods possess the property being measured, i.e. the property of “market value”. Both goods must possess the property of market value and, therefore, there must be two independent market processes at work. More specifically, supply and demand for the first good determines the market value of the first good. Supply and demand for the second measurement good determines the market value of the measurement good. 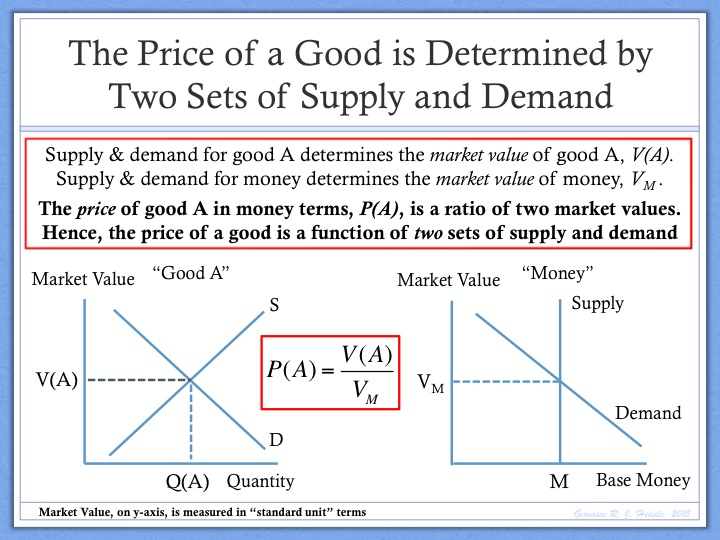 The price of the first good in terms of the measurement good is a relative expression of the market value of both goods and, therefore, is determined by supply and demand for both goods. The failure of economics to develop a comprehensive model of microeconomic price determination left the door open for another economic myth to be created. In the early 20th century, Alfred Marshall described the simple notion that supply and demand for a good determines the price of that good. However, if this is the case, then what does supply and demand for money determine? 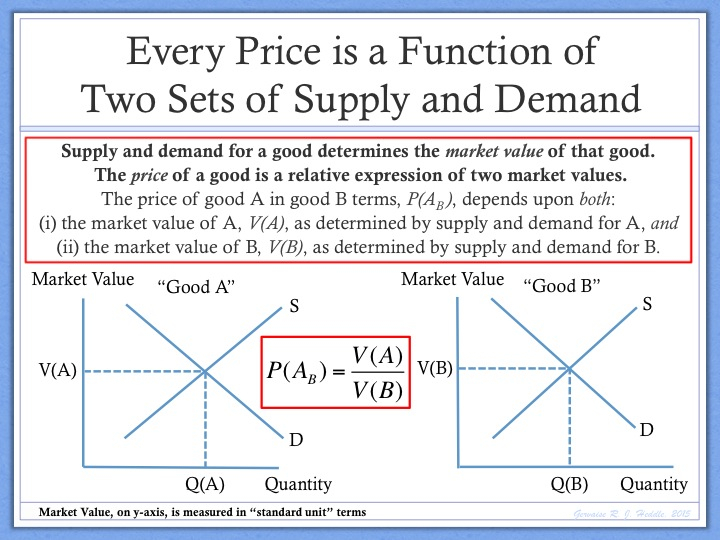 This apparent hole in Marshall’s price determination theory was filled by John Maynard Keynes who argued that supply and demand for money determines the interest rate: a misleading and dangerously simplistic idea sits at the heart of modern macroeconomic theory. This second economic myth has sustained itself for nearly a century because, at least superficially, it seems quite credible. For example, if I ask to borrow money from you, then what is the “price” of that money? One might argue that the price of that “money” is the interest rate that you charge me. The problem with this example is that it confuses the “price of money” and the “cost of credit”. When someone borrows money from another person, then that act creates a credit instrument and the cost of that credit is the interest rate. We could call the interest rate the “price of credit”, but really it isn’t a price at all. Why? Technically a “price” is a ratio of exchange, i.e. a quantity of one good for a quantity of another. The “price of money” is a ratio of exchange, not an interest rate. Technically, money doesn’t have just one price. Rather, money has many prices, depending upon which measurement good you are using to measure the value of money. For example, we can measure the price of money in terms of apples, or bananas, or in terms of a basket of goods. In each case, the “price of money” is a ratio of exchange reflecting how many units of a good must be exchanged for each unit of money. Moreover, the price of money is determined by two sets of supply and demand. For example, the price of money in apple terms is determined by both supply and demand for money (i.e. supply and demand for the monetary base) and supply and demand for apples. Conversely, the price of apples in money terms is determined by both supply and demand for apples and supply and demand for money. As discussed in the earlier section on price determination, every price is a relative measurement of the market value of two goods. In order for money to be accepted in exchange, it must possess market value. The market value of money is determined by supply and demand for money, or more specifically, supply and demand for the monetary base. In summary, supply and demand for money determines the market value of money, not the interest rate. The market value of money plays a key role in determining the price of all goods in money terms: all else remaining equal, as the value of money falls, the price of all goods in money terms rises. In contrast, supply and demand for credit (the act of borrowing and lending money) determines the interest rate. Both of the misconceptions described earlier have led, at least indirectly, to the creation of a third economic myth: inflation is caused by an overheating economy. The idea that the primary inflationary risk faced by the economy is an excess of aggregate demand is a fundamentally Keynesian view and one that draws primarily on the experience of the Great Depression. In essence, Keynesians believe that if too little demand created deflation in the 1930s, then too much demand must be the primary cause of inflation. Surprisingly, economists still cling to this notion despite the fact that the empirical evidence for this contention is poor. Anecdotally, some of the strongest economic periods in the last century, for example the 1990s, were characterized by low and falling levels of inflation. In contrast, some of the weakest economic periods, such as the 1970s, were dominated by high levels of inflation. From a theoretical perspective, the problem for Keynesian economists comes back to misconception #2, namely that supply and demand determines the interest rate. In the Keynesian view, the risk to inflation is that the Fed lowers the interest rate too far and this leads to an overheating economy and prices rise. In contrast, the view of The Money Enigma is that supply and demand for money determines the market value of money. The real risk associated with creating too much money is that it leads to a fall in the market value of money. As the value of money falls, prices in money terms rise. 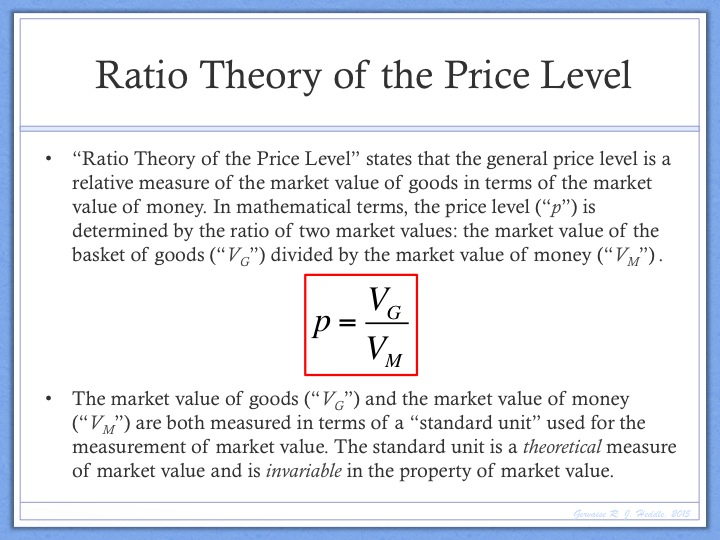 Ratio Theory of the Price Level states that the price level is a relative measure of the value of the basket of goods in terms of the value of money. In the short term, it is debatable as to whether it is the numerator or the denominator in the equation above that matters more. However, if we step back and think about what drives prices higher over long periods of time, it is very hard to imagine how “too much demand” could be the driving force. After all, basic microeconomic theory tells us that “too much demand” today will generally be met by an increase in supply at some point in the near future. Therefore, any rise in the value of the basket of goods, as measured in absolute terms, is likely to be temporary in nature. Rather, the view of The Money Enigma is that the primary driver of inflation over long periods of time is not “too much demand” but rather a decline in the value of money. If the central banks grows the monetary base at a rate exceeding the growth in real output, then the value of money will decline and prices, as expressed in money terms, will rise. In the last section, it was argued that, over long periods of time, the primary cause of inflation is growth in the monetary base that exceeds growth in real output. 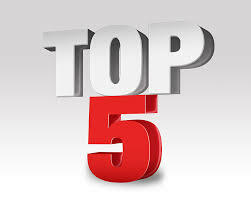 However, over short periods of time, the view of The Money Enigma is that inflation is not caused by “too much money” per se, but rather “expectations of too much money”. This may seem like a subtle distinction, but it is a very important one in practice. For example, it can explain why the quantity theory of money works in the long run, but not in the short run. The view of The Money Enigma is that money is a long-duration, special-form equity instrument that represents a proportional claim on the future output of society. Therefore, the value of money, and consequently the price level, depends primarily upon long-term expectations regarding the future levels of real output and the monetary base. If people are optimistic about the long-term economic future of society, then they might reasonably expect solid real output growth and restrained levels of growth in the monetary base. This combination of expectations supports the value of money today and keeps a lid on prices as expressed in money terms. However, if people suddenly become more pessimistic about the long-term future, then they might reasonably expect real output growth to stagnate while monetary base growth keeps climbing. In this scenario, the value of money can decline sharply. In other words, it is not the amount of money that is created today that drives the value of money, but rather expectations regarding future levels of money creation. This phenomenon can help to explain why the massive monetary base expansion that has been experienced over the past seven years has not led to a significant decline in the value of money and a commensurate rise in prices. In essence, most market participants still believe that the monetary base expansion by the Fed is “temporary” in nature, i.e. quantitative easing will be reversed eventually. The current risk for markets is that the Fed stalls on the process of monetary policy normalization and fails to reduce the monetary base. In this case, the value of money could decline sharply and inflation could surge. For those that are interested, the relationship between and inflation is discussed in several posts including “Does Too Much Money Cause Inflation?” and “A New Perspective on the Quantity Theory of Money”. One of the most popular misconceptions among economists and policy makers today is that the accumulation of government debt has little to no impact on the value of money and inflation. Indeed, the popular view among some noted economists is that higher fiscal deficits are the best solution to any economic slowdown, even at a time when government debt as a percentage of GDP keeps climbing to new post-War highs. In contrast, the view of The Money Enigma is that the excessive accumulation of government debt has a critical role to play in the determination of the value of money and, consequently, the rate of inflation. The key to understanding the relationship between government debt and inflation is the notion that money is the equity of society. In essence, the view of The Money Enigma is that society faces very similar financing options to a typical corporation. When a company needs more funds, it can either issue debt, a fixed claim against its future cash flows, or it can issue equity, a proportional claim against its future cash flows. If a company issues too much debt, then this can begin to have a negative impact of the value of its equity, particularly if the company’s cash flow growth doesn’t match original projections. Similarly, when a society needs more funds to finance government deficits, it can either issue debt (government debt) or it can issue equity (expand the monetary base). Money, the equity of society, represents a proportional claim against the future output of society. Just as a corporation can get itself in trouble with debt and devalue its equity, so society can take on “too much debt” which, in turn, leads to a debasement of money. 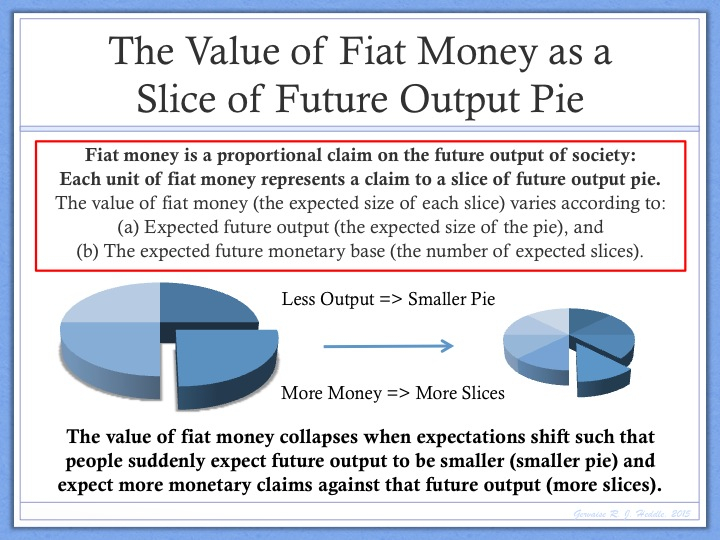 In essence, once it is perceived that a government has issued too much debt, then people begin to expect that (a) output growth will slow in the future, and (b) base money creation will accelerate in the future. This combination of expectations will damage the value of a proportional claim on the future output of society, i.e. it will lead to a fall in the value of money and a rise in prices. Ultimately, fiat money is only as good as the society that issues it. As a society approaches bankruptcy, the value of the money issued by that society becomes worthless. Nowhere is this concept more evident than in extreme cases of hyperinflation such as occurred in Zimbabwe in the 2000s. This entry was posted in Uncategorized and tagged heddle economic theory, problems with economic theory on 12/15/2015 by themoneyenigma.